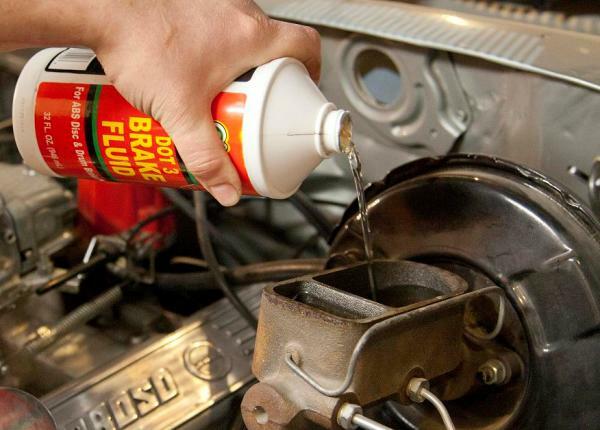 Brake fluid may be one of the most neglected areas in our vehicles. Hey, if the brakes are functioning properly, why worry, right? Despite being frequently overlooked, brake fluid serves a vital purpose of transferring foot pressure to the brakes or hydraulic clutch system. Proper care and maintenance is just as important as any other fluid used in our vehicles. To break it all down, there are usually two main concerns when it comes to brake fluid: what should the boiling point be? And which fluids are compatible? If you look at the chemistry behind most brake fluid, it comes from the combination of various types of glycols, which are basically a mixture of non-petroleum and other alcohol-based fluids. After a mixing process, the chemical name gets shortened to “polyglycol.” In addition, there are also high-grade silicone-based fluids, which cannot be mixed with any other type of fluid. So whether it's used in the brake or clutch system, it's important to understand the differences between these common types of brake fluid. The brake fluid must maintain specific properties. Our brakes can get hot, sometimes up to 1200 degrees, so the fluid needs a high boiling point. Also, because our vehicles experience seasons just as we do, it’s important to have a low freezing point as well. On top of maintaining both extremes, it's designed not to damage any rubber components in the brake system. As a result, the chemical properties found in most brake fluids can permanently dull or damage paint. So be sure to handle with care and be quick to clean any accidental overspills. Brake fluid is hydroscopic, meaning it has a natural tendency to absorb moisture. And over enough time the added moisture can result in corrosion build up or a decreased boiling point. It’s never a bad idea to change your brake fluid every couple of years and try not to leave your reservoir cap off any longer than needed. DOT 3 is the most common type of brake fluid used in domestic cars and trucks. According to the Society of Automotive Engineers (SAE), DOT 3 can absorb 2 percent of its volume in water every year. Over enough time excessive moisture will cause corrosion in the brake system which can lead to issues like vapor-lock or a spongy pedal. DOT 4 is formulated for use by all vehicles, it has a higher boiling point than DOT 3 and it does not absorb moisture as fast. DOT 4 and DOT 3 are interchangeable, however it's best to avoid adding DOT 3 fluid to a system that already uses DOT 4. It's the preferred type of fluid used for street and high performance applications. DOT 5 (often referred to as synthetic brake fluid) is silicone-based, which means it does not absorb any moisture. Many street rodders would use synthetic because it's not corrosive to paint or other brake components, which makes it great for preserving classic cars for long periods of time. But there are a few drawbacks to silicon-based fluids. They expand more when compressed, which can make the pedal feel spongy. Also, DOT 5 fluids cannot be mixed with any other type of brake fluid. DOT 5 will usually have a violet tint in color to distinguish it from DOT 3, DOT 4, and 5.1 fluids. DOT 5.1 is a non-silicone-based polyglycol that has a boiling point over 500 degrees. Unlike DOT 5, DOT 5.1 can be mixed with DOT 3 or DOT 4. Also, DOT 5.1 will usually have the highest rated boiling point, which is best recommended for severe duty and high performance applications. Afco racing offers Ultra HTX that exceeds DOT 5.1 requirements with a boiling point rated over 600 degrees.